Homily (Sermon) – Spiritual Revolution. "Your mind must be renewed by a spiritual revolution so that you can put on the new self that has been created in God’s way." Change happens all the time. Everything changes. Sometimes change is good, 'A change is as good as a rest', they say. Sometime change is bad, like an illness or bereavement. Change can happen slowly, an evolving process that is sometimes difficult to see. Change can happen quickly, a revolutionary change that changes everything suddenly. Paul tells us today to change, not a slow considered comfortable change, but a fast revolutionary change. A complete change. We must put on a new self, as if we are putting on a new set of clothes, a new self created in God's way. This must be a good change, as it will bring us closer to God. But any change described as revolutionary has to be scary. What am I going to lose? Will I like the new me? What will I have to do? Am I going to be able to change? How do I change? And dozens more questions like this should be running through your heads. Or are you thinking I don't need to change? Have you already got your life right? Are you already living in a self that's been created in God's way? I know I am still trying to change, still looking for ways to become more like the person God created me to be than the person I have evolved into during my life. I think I am evolving into the man God wants me to be, I have to admit I am scared to think that revolution not evolution is what's called for. We are given a huge and historic example of revolutionary change in our reading from Exodus today. Everything has changed for the Jewish people, they have left their home and security and followed God and Moses into the desert. They are scared and they are hungry. They start to worry, then they start to complain, they challenge God and he provides for them. He sends them quail and manna, bread from heaven. Here is a good lesson for us, change isn't easy, when it gets difficult ask for help, your father in heaven will provide. If He can feed two and a half million people everyday for forty years in a desert, he can help you with your worries. The same Exodus story is picked up and quoted in our Gospel reading today. As we heard last week, a large crowd have just been feed from a small boys packed lunch, and have now following Jesus across the lake. The people believe he might be the messiah prophesied in scripture and are hoping he will prove this. The miracle of the loaves and fish shows he is a prophet but it was just earthly bread he gave them to eat. The messiah would give them manna from heaven as Moses had, bread directly from God not of human making. In their concern for bread and manna, their desire to see scripture fulfilled as they thought it should be, they missed the real miracle, they miss the truth, they miss Christ. I have to be honest, I would I am sure have made the same mistake, and that shows me I still need to change. Christ goes on to reveal to them that, true bread from God comes from heaven and gives life to the world, and the He is that bread. All we have to do is come to Him and believe in Him. One of the most wonderful privileges I have as a minister in this church is to distribute holy communion. I get to stand at the front of church and smile at each one of you as you receive Christ, the bread of life, many of you are privileged enough to receive the Eucharist, Christ in the form of Bread and Wine, some for whatever reason receive a blessing from Christ. We all, in those moments have the chance to turn to Christ, to believe in Him, to never be hungry or thirsty again. To start the revolution within ourselves. To become the creation God intended us to be. Aren't you just a little curious to see what that will be like? It is your choice. Are you ready? Will you receive Christ? Will you believe in Christ? Will you change? Will you start your personal revolution? And remember, if you do decide to change, when you get worried ask your Father for help, He will be there. You can read a more detailed post at the UK in the Holy See website. I don't know how I missed this, but in May our MP voted to relax the Sunday trading laws to allow shops to open longer during the Olympics. I am concerned about this for several reasons, the first is personal, my wife Gail works in a shopping mall and she will have to work later or start earlier on the Sunday's during the Olympics. She has no choice if she wants to keep her company happy and keep her job. Secondly, I don't understand the ever increasing need to shop. The erosion of family time, to be replaced with purchasing time seems wrong to me. Happiness doesn't come from stuff. Don't get me wrong here, I like stuff, and I have more than my fair share of it, but the stuff doesn't make me happier than I was when I was without it. In fact for the last few months I haven't been working so money is getting tight, I am happier now buying less but with more time to spend with my family and friends. I do shop on a Sunday, it's easy and convenient. But it's not so easy for those having to work Sundays, they get no extra money and if they don't agree to work Sundays they don't get the job. The opt in and opt out clauses in the original bill don't seem to be working. Companies just expect their staff to put in the hours. But are companies really making extra money? I question if a small shop in a large shopping mall will make any extra money and they will have to pay extra for staff and managers to be in. Money is tight at the moment for everyone, if people have longer to spend the same amount of money then surely businesses will suffer. It also seems a shame to me that after all the effort made to bring and host the Olympics in the UK, that extra effort is being made to drag people away from the sporting hero’s and special of the event. My personal view is that Sunday is a Holy day, a day set apart, scared, a time to be spent with God. My first understanding of this concept was the awe with which I watch Eric Liddell, in Chariots of Fire, refuse to run on a Sunday. What could make a man give up a dream like an Olympic Gold Medal, the answer is Love, Love of God, and more importantly a realisation of Gods love of us. I think I need to watch that film again in preparation for the Olympics, and in preparation for my personal attempt to shop less and God willing, not at all on a Sunday. I'll conclude this post with a quote I found in the BCC news item about change to Sunday Trading laws. Homily (Sermon) – The Lord Provides, Introduce others to Jesus, Offer what you have. 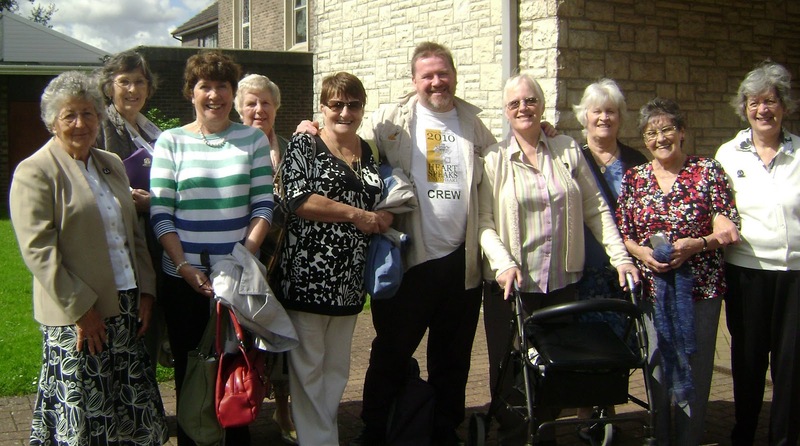 This was my first homily to St. John Fisher in 2009 and to a real congregation. It was based on three points, 1. The Lord provides in abundance, 2. Introduce others to Jesus and watch what happens, 3. Offer what you have it's amazing what the Lord can do. Last Sunday I was lucky enough to be by myself in San Francisco, I got up early and went to Mass at St Patrick's church in the down town area. Then I walked to the ferry port and got a ferry across the bay to Sausalito, then a bus to Muir woods, where the giant redwood tree grow. It was a beautiful sunny day and in the cool shade under the trees, I spent the next two hours walking up the side of a mountain. At about 1000ft up as the path turned and started back down, I stopped, had a long drink of water and wished that I had been sensible enough to bring something to eat. Listening to the gospel we have just heard reminded me of that feeling of hunger, so in a small way I can really feel for that crowd that followed Jesus. Today's gospel is probably familiar to us, it should be as the miracle described, the “miracle of the loaves”, is the only miracle described in all four gospels. It is even described twice in the gospels of Mark and Matthew. It's also, not the first time miracles about people being feed are performed, as we heard in the old testament reading Elisha feeds 100 men with only 20 loaves. Because it's so familiar, it is easy for us not to listen carefully, or not to think what does this mean for me today. But because it's repeated so often it must be significant, therefore all the more reason to study the words we have heard today. Elisha was a great prophet about 900 years before Jesus, he performed many miracles, like curing the sick, raising the dead, feeding the hungry, he even made iron float, a miracle we don't hear Jesus doing. The large crowd that followed Jesus up the hillside would know about Elisha. The author of John's Gospel would also have known that his readers would be well aware of who Elisha was and what he did. There are two differences in the story's, the first is how the miracle is performed, the second is the numbers involved. Elisha's miracle is performed by the word of the Lord, “They will eat and have some left over” spoken by a prophet. Where as Jesus, performs the miracle by giving thanks and giving out the food. The number of people feed too, is much bigger, 50 times bigger. What Jesus is demonstrating and what we are being told is that Jesus is more than Elisha, much more than a prophet, Jesus is the messiah, Jesus is the son of God. In John's gospel it's this miracle of the loaves, not the last supper which isn't mentioned, that Jesus uses teaches us of the bread of life and the Eucharist that we will share together in a few minutes. 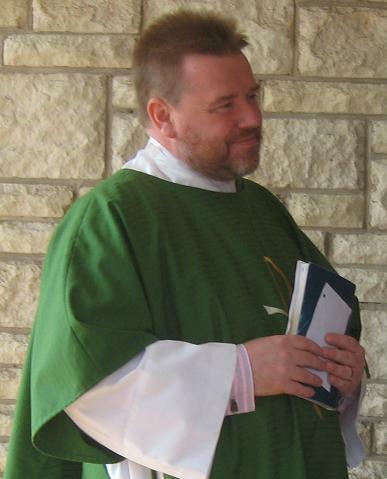 I wont steal any more from Fr. Franks homily next week, because next weeks Gospel continues, directly after this one. So try and remember this story when your listening next week. I would like to turn now, to what this gospel can teach us about our lives today. What should we ponder on this coming week? How should we live our lives in accordance with the gospel? 3. Offer what you have, it's amazing what the Lord will do with it. First lets think about providing in abundance, we heard today not only of the feeding, but of the leftovers. The Lord says, “They will eat and have some left over”, and “they filled twelve hampers with scraps.” For us we must trust that the lord knows what we need and will provide for us, not just the minimum to survive, but in abundance, whether that abundance is food, friends, knowledge or spiritual support. We as Christians are not guaranteed an easy life, in many ways the opposite, we are not praying for an abundance of wealth or for all the sweets we can eat. When we are doing the lords work, he will support us, give us the gifts to do that work, and give them to us in abundance. The very fact I can stand here trying to break open the word of the Lord is an example for me, of the abundance of his gifts. Next, Introducing others to Jesus. Andrew, one of my favourite disciples for this very reason, is always introducing people to Jesus. Here we find him introducing a small boy with his packed lunch. Why did he do it? Would all his friends, the other disciples, laugh at him for suggesting this boy could help? Or did he think, Jesus will turn this small meal into enough for everyone? I doubt it. But Andrew took that risk and look what happened. It's because of people like you that I found a faith in Christ, the way you live your lives this week could change someone else's life, it could help them find Jesus. Finally, offer what you have. Did the small boy today say, “No its my lunch and I am not sharing, get your own.” No he gave it to Jesus, who gave is back five thousand fold. Charity is one of the great pillars of our faith, watch what happens when you give, of your time, your love, your skills or even your wealth. God will take it and do something amazing with it. So this next week, give a little, live your faith, and rejoice in the abundance of good things given to us by our Lord, who is loving in all his deeds. At the end of this Mass you will be sent into the world. You will be sent to announce the Gospel of the Lord, to glorify the Lord. As followers of Christ we come to this church to worship Him, to love Him, to receive Him into our lives. We listen and learn from His teaching in scripture, we fuel our bodies and souls from the Eucharist. We prepare ourself to do His work, to live our Christian lives. Then we are sent into the world as the twelve are summoned and sent in today's Gospel. How prepared do you feel, right now, to go. You should go in pairs, so you can support each other, protect each other, one working one praying. You should take very little, the clothes your wearing are fine, you don't need any more. Don't take money, leave your credit cards behind, you will be provided for, and if you are not then leave, move on. Tell people to correct their ways, fight evil when you find it, cure the sick. Are you ready to do this? Think how the disciples felt, they had come to Christ to learn, and now after only a few months with Him, they are about to leave him for a short time to do the work He has been doing, they are being sent out by Christ with His authority. Fear and terror mixed with Christ's peace and grace. Divine gifts and human weaknesses. We are told in only one small sentence about their successes, they cast out many devils and anointed and cured many. We can only assume we are missing out on many stories similar to those we hear of throughout the Gospels, Acts and the letters of the New testament. It's difficult to compare ourselves to these men. To the men who walked with Christ, ate with Christ, who were chosen by Christ to build his Church and teach his message. But that is us! We are called to walk with Christ, to eat with Christ and to teach his message. As Paul tells the Ephesians and as Paul tells us today, each one of us, every one of us, have been chosen by God. He choose you! He choose you to be set apart from the world but still very much in it. He choose you to be spotless, not through your actions but through his forgiveness. He choose you, to be His daughter or His Son. He choose you to live with Him in love. You are part of Gods plan, you are to play a part in his Glory. You have heard the message of Christ, a message of love, repentance and redemption. To believe in this message, is to accept Gods choice, to realise that you are special in the eyes of God, that you have been called to serve. Our world is in need of our teaching, our love, our service. There are many out there who don't understand our Church, who have never heard in their hearts the call of Christ. There are many out there who are in need of healing, body and soul. There are many out there who need feeding, who need to be cared for, who need to be loved. Christ has built an eternal Church, towering throughout the ages, blazing with the lives of the saints, to continue His Work and His mission. Each generation passing His Church to the next. Today, you are that Church, how are you going to serve? What is Jesus asking you to do? I am not asking you to walk from town to town preaching on street corners, unless you believe that's your calling. I am asking that you consider what your calling is, what Jesus is asking you to do. Being part of Christ's Church is about all of your life, everything you do, everything you say. He has summoned you, He is sending you, what is he asking you to do? As we hear in the Psalm, “The Lord will make us prosper and our earth shall yield its fruit. Justice shall march before Him and peace shall follow in his steps.” Is it time to ask ourselves and ask our Lord in prayer, where will following those steps of peace lead us? Where should we march? Please click here for an Index of all my homilies and notes. During the winter we often have an open fire at home. It's wonderful sitting in front of it watching the flames dance and feeling the warmth on your face. To get the fire started I use a layer of screwed up newspaper, on top of that a layer of kindling, often twigs gathered from the garden over the summer, finally on top of that coal or logs. If everything is dry a single match will have the fire burning well in a few minutes, but if the matches, paper or twigs are damp it's really difficult to get a good fire started. Flames are often used as an analogy of faith. They provide light and heat, and they spread quickly. Faith leading to good works provides light and hope and it leads to that faith spreading and growing quickly. However, scepticism like we hear about in today’s Gospel acts just like dampness, stopping the spread of faith and the effect of the good works. After leaving home to start his ministry Jesus toured the towns and villages of Israel, we hear today what happened when he returned home to bring the good news he was preaching to his home town. The people who knew him as he grew up couldn't see passed the man he was to His divine nature. How could a common man, a man like them, perform miracles and preach with authority. They refused to believe in the Son of Man, they refused to believe in the Son of the living God. All they could see and hear was the carpenter, Mary's son. What surprised me was Jesus' reaction. He didn't prove himself with big miracles. No walking on water or feeding thousands here. He taught them as he taught everywhere else, and they were amazed as they were everywhere else but because they knew him they couldn't find the faith to believe he was sent from God. Their human good sense, the common sense of the town got in the way. It got their faith damp and stopped the fire of that faith blazing in their hearts. Without faith, there was no room for God and no room for miracles. When we rely on ourselves, our judgements, our skills, our strengths and our common sense we limit Gods presence in our live. We can set limits on God, just as the people of Nazareth set limits on Jesus, “Jesus can't be from God we know he is Mary's son”. Our human strengths can be our spiritual weaknesses, a strong man has no need of God to help him complete his daily work. A clever man has no need of God to help him solve a problem. A man filled with societies wisdom doesn't need to turn to God to understand the way the world works. The problem is if we don't turn to God for help with our daily work, help with the problems that face us and help dealing with the world around us, then our actions will amount to nothing. We may do well financially, we may be popular, but we will have missed our chance to be part of Gods plan, missed our chance to help forward his kingdom on earth. This isn't a new problem, St Paul is describing exactly the same problem that effected him 2000 years ago. Paul was a clever and connected man, an educated Roman, able to rely on his own skills, abilities and contacts. When Paul started to follow Christ, after his encounter with the risen Lord on the road to Damascus, he was blessed with weakness. Paul needed God in everything he did, and therefore looked on all his weaknesses as opportunities to let God into his life, his work and his mission. As a result of this today, we can reap the long term benefits of the work Paul did in his weakness with God as his strength. We need to treasure our faith. It won't matter how well I preach today if I didn't prepare in faith, and it won't matter how attentively you listen if you don't listen with faith. If faith is the foundation of all our actions then Christ Himself becomes the foundation, the cornerstone of all our actions. Faith will grow, hope and light will flow from our actions. We will bring Christ's kingdom, we will bring Heaven here to earth. Our scriptural lesson for today is beautifully summarised in the Psalm. Our eyes, like those of the servants we are, should always be on the hand of our master, waiting to see what He need us and wants us to do. We need His mercy, his grace, his forgiveness, because all to often we are full of contempt, our souls full of greed and pride. We need to turn to God in weakness, and in faith. That's where faith, even small, questioning, unsure, unconvinced, confused faith begins to kindle the fire. And faith turned toward God will kindle quickly and spread just as flames through dry paper and twigs. You may also be interested in my Thought for the Day about Weakness and Strength. 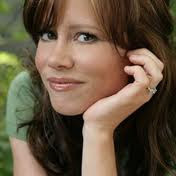 One of my favourite singers in a young lady from the USA called Sara Groves. I have been inspired by her music for almost a decade now and yesterday I spotted on twitter that she is coming to the UK to tour later this year. While the England dates and locations are not yet announced on their website or the ticket site I did ask Troy Groves, via twitter, if they would be coming to Bristol and the answer was: "@JohnCScanlon we are coming to Bristol!! Just booked 4 England shows. Will be adding to site soon. Look forward to meeting! T"
If you haven't heard of Sara Groves or heard any of her music you are missing something very special and powerful moving. Her music is spirit filled, beautiful, and challenging. I often have her music on when I am writing my Homilies or when I need music to help me pray. She has released 10 albums, and you can find them on Amazon and iTunes as well as on her own website www.saragroves.com. You can also find several of her video's on YouTube and I have linked to a couple of them below to give you an idea of how lovely her music is. The nice thing about her own website is that it has the lyrics for all her songs as well, and as they are such powerful reflection on Christian life it's well worth spending time reading as well as listen to her words. I'll post again as soon as more information is available. This video is from probably my favourite album Conversations, and it's called Hello Lord. The video is from the latest album Invisible Empires, and it's called Eyes on the Prize.